J.W. Marr recently shot a better deer than most hunters ever see. The whitetail back was in full-velvet with 10 long main tines, a scattering of sticker points and a gross Boone and Crockett score of around 170 inches. 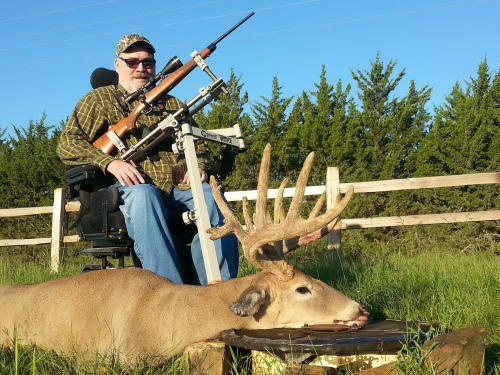 Marr, a quadriplegic, credits Kansas special early September season for youth and disabled hunters for helping him not only get afield, but have a good chance at such a great animal. Marr was in the marines, and a presidential helicopter security guard for presidents Nixon and Ford, when he broke his spine in a rodeo in 1974. With the help of family, friends, and special outfitters, he has been able to continue his life-long love of hunting. He’s been to Africa three times, and has shot animals including Cape buffalo, leopard, kudu, sable, zebra and oryx. He’s also tagged elk, pronghorn, bear and mule deer on American hunts. Most of those animals were legally shot while Marr was inside a vehicle, on costly guided hunts. The 64-year-old hunter has taken advantage of Kansas’ Youth and Disabled Season since it began in 2000. The season is for youth 16 and younger accompanied by an adult. Any hunter who qualifies for a handicapped placard for a vehicle is eligible. The season annually runs nine days, to include two weekends, in early to mid-September. As well as nicer weather, Marr said the timely travel patterns of bucks helps those with disabilities. Later in the fall, he said, bucks are more unpredictable as they search for does or new food sources. Making quick moves is almost impossible for those limited to wheelchairs and sizable permanent blinds. As well as coming to the same field in September, the deer usually take the same trails at about the same time in the evening. That allows his brother to help him get his blind, wheelchair and rifle set-up as well as possible. Things certainly lined up on the morning of Sept. 9th when Marr shot this year’s trophy. For the past two seasons he’d watched the buck often cross the property he and his wife, Terry, own near the Verdigris River. It took his brother and wife to get his wheelchair in position on opening morning, Sept. 8, but the buck didn’t show. They did the same that second morning and all went as planned.